650mAh Battery For E-Cig Assortment. Color May Vary. 10ct. ..
Electronic Cigarette USB Charger 510 Thread. 20ct. 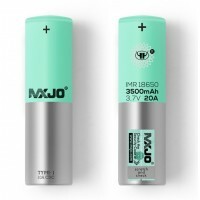 ..
MXJO 18650 3000mAh Rechargeable Battery (TYPE-2 20A CDC). 2ct. Model : 18650 Capacity : 3000..
MXJO 18650 3500mAh Rechargeable Battery (TYPE-1 10A CDC). 2ct. Model : 18650 Capacity : 3500..
CBD 350mAh Variable Voltage Adjustable Battery with Charger. Colors May Vary. 5ct. USB Charger..
710 Pen On The Go Buttonless Battery With USB Charger. 1ct. ..
900mAh Rechargeable Battery With LCD Screen. 1ct. 0.65 inches blue LCD display screen Showin.. Battery Charger for Rechargeable Li-ion Battery 18650 18350 26650 16340 14500 CR123A. (Batteries Not.. Battery For Mod SLW 18350 900mAh 3.7v. 1ct. ..
Bogo 400mAh 2pk Adjustable Voltage Battery Charger Kit. Colors May Vary. 1ct. Press 5 Times Fo..